Akeda DC16 Dovetail Jig. (c) 2010 Chris Baylor licensed to About.com, Inc. The AKEDA DC16 Drawer Construction Jig takes a bit of an innovative approach that differs from many other dovetail jigs. For instance, the DC16 utilizes a dual guide bar system on which the base of your router glides across, providing a much more stable platform to keep the router square to the jig (and board) than other dovetail jigs. The router is guided by a collar in-between fingers to make precise cuts. 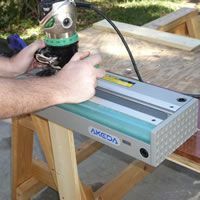 In this woodworking review, learn all about the AKEDA DC16 Drawer Construction Jig. Katie Jig Dovetail System. (c) 2010 Chris Baylor licensed to About.com, Inc. The Katie Jig Dovetail System is a dovetail jig with a bit of a different design than many of the other jigs on the market. The jig has adjustable fingers that allow you to create any number of variations of pin and tail positions. By adding the optional Dovetail Toaster, the Katie Jig has a clamping system that is really better than found on many other jigs. Check out this innovative dovetail jig in this woodworking review. Keller Dovetail System. (c) 2010 Chris Baylor licensed to About.com, Inc. The Keller Dovetail System was the original router-based dovetail jig on the market 30 years ago, and it is just as effective today for making consistent, repeatable through dovetails. One of the biggest advantages of this system over most table-top dovetail jigs is the ability to create dovetails on very wide boards, making it ideal for building large dovetailed chests. Read all about the Keller Dovetail System and how you can use one with your router to create various dovetails on your woodworking projects. Leigh D1600 Dovetail Jig. (c) 2010 Chris Baylor licensed to About.com, Inc. The Leigh D1600 Dovetail Jig is router dovetail jig built from aircraft aluminum, making for a clean and very sturdy adjustable dovetail jig. The instructions can seem a bit overwhelming when learning how to use the jig, but in just a few minutes you'll be up and running and realize that it really isn't all that complicated. The jig is actually quite easy to use once you get the hang of it. Learn how to use the Leigh D1600 Dovetail Jig to make a variety of dovetails for your woodworking projects. MLCS Pins & Tails Half Blind Dovetail Jig. (c) 2010 Chris Baylor licensed to About.com, Inc.
Woodworking tools and accessories don't always have to be expensive. For instance, the MLCS Pins & Tails Half Blind Dovetail Jig allows you to create half-blind dovetails at a fraction of the cost of other router-based dovetail jigs. 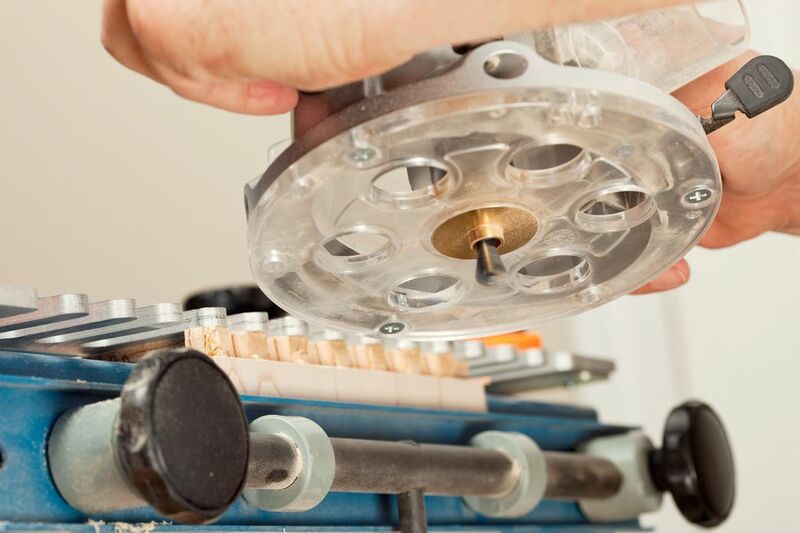 In this woodworking review, learn all about the MLCS Pins & Tails Half Blind Dovetail Jig. MLCS Pins & Tails Through Dovetail Template. (c) 2010 Chris Baylor licensed to About.com, Inc.
Another inexpensive dovetail jig similar to the MLCS Half Blind is the MLCS Pins & Tails Through Dovetail Template. Similar to the previous review, the MLCS Pins & Tails Through Dovetail Template allows you to create through dovetails without spending a lot of money on a dovetail jig. In this woodworking review, learn how to use this value-priced dovetail jig for the through dovetails on your woodworking projects. Porter-Cable 4212 Dovetail Jig. (c) 2010 Chris Baylor licensed to About.com, Inc.
With the Porter-Cable 4212 Dovetail Jig and a woodworking router, you can effectively cut clean through dovetail joints, as well as straight and rabbeted half blind dovetails, box joints and even sliding dovetail joints. While there are a couple of areas that I'd like to see the Porter-Cable address, the Porter-Cable 4212 Dovetail Jig would be a solid addition to any woodworking shop.